■ Laparoscopic dismembered pyeloplasty was introduced in 1993. ■ Both dismembered and nondismembered pyeloplasties (Foley Y-V, Fenger) may be performed using transperitoneal and retroperitoneal approaches. ■ The transperitoneal approach has been used in most pyeloplasty series. ■ Morbidity of transperitoneal laparoscopic pyeloplasty is considerably less than that of open pyeloplasty. Complications occur in approximately 11% to 20% of patients. ■ Success rates in most recent series of transperitoneal laparoscopic pyeloplasty are above 90% and similar to those obtained with the open approach. ■ Laparoscopic dismembered pyeloplasty is feasible and safe in children. ■ The learning curve of robot-assisted laparoscopic pyeloplasty is steep. ■ The ability of laparoscopic pyeloplasty to directly identify crossing vessels and reduce a large renal pelvis recapitulates the advantages of the open approach. ■ Laparoscopic pyelolithotomy with concomitant pyeloplasty is feasible. 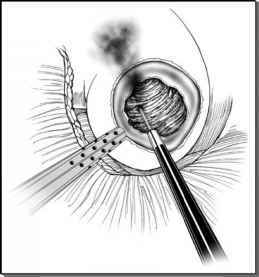 ■ Laparoscopic pyeloplasty in the setting of an ectopic or horseshoe kidney has been performed successfully.